His father, who died last Friday at age 94, has been memorialized among a bipartisan chorus of voices since his death for his commitment to national service and dedication to his family. 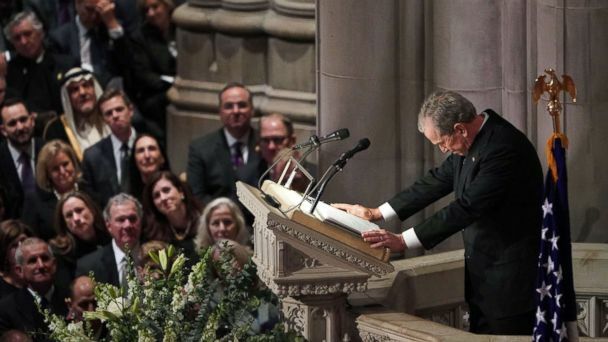 His funeral service at the National Cathedral marked a rare and very public gathering of the nation's living presidents and first ladies. The last time the Bush, Clinton, Trump and Obama families were at the same public event was in January 2017, at Trump's inauguration. The first eulogist, historian and Bush biographer Jon Meacham, told the story of a 20-year-old George H.W. Bush surviving being shot down during World War II. "For the rest of his life, he asked, almost daily: 'Why me? Why was I spared?' The rest of his life was spent proving himself worthy of that salvation, Meacham said. Meacham recalled how Bush, while campaigning, once shook hands with a mannequin. "You never know," Meacham said Bush replied when told. "Relax," he told the gathering. "George told me I only had 10 minutes."